Researchers conduct a re-enactment of the method presumably used in Pakistan to drill teeth 9,000 years ago. A flint drilling tip was mounted in a rod holder and attached to a bowstring. In less than a minute, the technique produced holes similar to those found in prehistoric teeth. 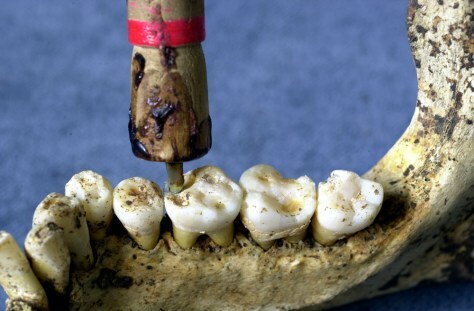 One important difference: The Neolithic dentists performed their operations on living humans.